With its vintage good looks and able timbre, 2009's offering is a credible addition to Takamine's hall of LTDs. Vintage looks. Punchy tone. Strong and versatile plugged-in sounds. A little light in the bass department when played acoustically. For 40 years Takamine has been at the forefront of acoustic guitar development and amplification. In 1978 the Japanese company released its first electro model and since then it has crafted plenty more, earning a reputation along the way for affordability and innovation. Today, boasting a huge user list that includes the likes of Bruce Springsteen, Glenn Frey, Brad Davis and Steve Wariner, 'Takamine' and 'electro' are virtually synonymous. In 1987 Takamine launched its first annual limited edition. Every year since has seen the release of a new LTD model, each one featuring something different from the 'regular' range in terms of either design or aesthetics. Recent years have seen some beautiful soundhole, bridge and fingerboard inlays and designs - 2004's Draco And Bear and 2005's Cat Tail being outstanding examples. The 2009 model is something of a departure from the previous 21 LTDs. Rather than being adorned with contemporary lines and graphics for a modern feel, 2009's LTD is a classy, vintage-looking piece. A sunburst finish, the vintage-style broken-diamond fingerboard markers and delicate mother-of-pearl inlays to the bevel-edged pickguard all reference classic Gibson models - and beautifully executed it all is too. We particularly liked the addition of the symmetrical, matching floral inlays at the base of the soundboard; their position augments and complements the bookmatched solid spruce top as well as underlining the ornate classic feel to this guitar. A two-piece solid mahogany back is divided and edged by elegant cream binding - the same material is used for the heel cap and the centre strip that surrounds the strap button/input jack. The abalone soundhole rosette completes the adornments to the LTD's spruce top and contrasts beautifully with the vintage sunburst, while the cream-bound ebony fingerboard has been shaped to fit snugly round the top of the soundhole in a classical style, rather than the traditional squared-off shape. This LTD model's NEX body shape is Takamine's own creation - designed to bridge the gap between powerful jumbos and responsive smaller-bodied models. The dimensions confirm that it's not as tall as a 'regular' jumbo, and only a smidgen narrower at the widest part of the lower bout. The waist is slightly narrower than you'd find on, say, a J200 and, in an effort to give more volume, the body's depth is that of a 'standard' Dreadnought. Takamine has gone to great lengths to really give this year's LTD a sense of vintage elegance and has cleverly done so without overstocking the decorations cupboard. We'd say that for those of you who are drawn to the appointments and embellishments of classic models from the original 'golden age', the LTD 2009 has a lot to offer. The slim profile neck, in addition to an excellent factory set-up, certainly makes for a comfortable playing experience. Played with a medium gauge flatpick, the LTD 2009 offers a bright and crisp tone, the high end has good clarity and the punchy mids provide good tonal separation. The bass register is responsive although, at times, it feels like it lacks sufficient presence for fingerstyle. The LTD 2009 benefits from more Takamine in-house creations: the palathetic pickup and the CTP-2 Cool Tube preamp. The Cool Tube's valve can be dialled in or out to taste, and really does add warmth and some 'meat' to the electro output. It's plugged-in that the LTD 2009 (and some would say this is true of most Takamines) comes into its own. The amplified tone is clear, bright and full of body, the controls do what they're supposed to and, once familiar with the responses of the three-band centre-indented sliders and single mid-frequency rotary, a wide range of sonic options are available. 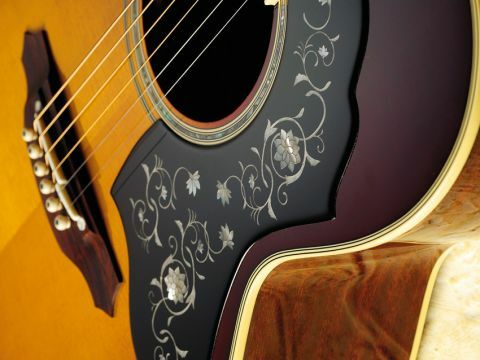 Annual limited guitars like these have a habit of illustrating just where a brand is at a certain time, and the classic vintage adornments suggest that Takamine is well on the ball in terms of current fashions in the guitar market. But this retro vibe is contrasted, or perhaps balanced, by the sophistication of its onboard electronics. The net result is a well built guitar that's superbly presented and packs a mean punch - particularly plugged-in. The LTD 2009 would suit a busy gigging acoustic player who favours vintage looks, but with professional plugged-in capabilities. There's a lot of choice out there, but if you're searching for a top-notch stage guitar, ignore Takamine at your peril.